Did George W. Bush Dodge the Draft? From the beginning, Bush's service with the Guard was poor. He took the Air Force Officers Qualification Test and scored a weak 25 percent for pilot aptitude on the screening test. Molly Ivins (Shrub) wrote that Bush was assigned to one of the coveted, last two slots for the Guard in the state. This came after he scored a dismal 2.5 on the qualifying test, barely making the grade. Assigned to a safe plane -- the F-102 -- that was being phased out. As Bush has been quick to note, National Guard members do face the chance of being called up for active duty, though few actually did during the Vietnam war. So what a lucky break for Bush that he was assigned to fly the F-102 Delta Dagger, a plane already being phased out. In fact, the Air Force had ordered all overseas F-102 units shut down as of June 30, 1970-- just 3 months after Bush finished his training. Since training is so airplane specific, Bush was guaranteed from the beginning to be safe from combat. Just didn't show up for a year -- with no punishment. National Guard records and Bush's own supervisor's and friends show no sign of him attending any drills or performing any service for nearly a year, from May 1972 until May 1973. This period began with Bush moving to Alabama for a political campaign. He later applied to transfer to a base that had no work; the transfer was first approved, then canceled. Bush did nothing for several months; then in September he applied to transfer to Alabama's 187th Tactical Recon group for 3 months. This was approved, but the unit's commander, General William Turnipseed, and his then admnistrative officer, Kenneth Lott, have both said that Bush never showed up. "Had he reported in, I would have had some recall, and I do not," said Turnipseed. "I had been in Texas, done my flight training there. If we had had a first lieutenant from Texas, I would have remembered." How does one "lose interest," and fail to fulfill their assigned military responsibilities, without a court martial? Why was this exception made for Bush? And what was he doing in those absent months after the campaign in Alabama was over? Bush apparently reached his nadir around Christmas 1972. Home for the holidays, worrying his parents by working too little and partying too much, he got carried away at a party with his 15-year-old brother Marvin, and drove the boy home drunk, smashing into a neighbor's garbage cans and infuriating his parents. His father asked to see him in the den, and a drunk George W. burst in: "I hear you're looking for me. You wanna go mano a mano right here?" After the drunk-driving incident, his worried father got him a job at Project PULL (the placement Hatfield would insist was community service to expunge his alleged cocaine bust). And Bush may be counted among the many young people the inner-city project saved from self-destruction. Regardless of whether the community service at Project P.U.L.L. was for drunk driving, or cocaine possession, or just a job-he failed to show up for any of his scheduled Air Force National Guard duties. In most circumstances, that would at best, qualify one for active duty- or at worst, a court martial. In January of 1998 and what seems like a full lifetime ago, I was stricken by a deadly case of meningoencephalitis. I was returning from a short duty trip to Panama as a team chief to inspect the hand over of Ft. Clayton to the Panamanians. I had been 'loaned' from the senior staff and state planning officer of the Texas National Guard to the Department of the Army for a series of these special projects after angering George W. Bush by refusing to falsify readiness information and reports; confronting a fraudulent funding scheme which kept 'ghost' soldiers on the books for additional funding, and refusing to alter official personnel records [of George W. Bush]. The most logical explanation I could find was that there was a disciplinary action required for record, but that Bush was due to attend Harvard, so he was assigned to the Obligated Reserve Section (ORS), which in effect, means Bush was on a wait list to be called up to active duty, based upon his specialty training and the necessities of war. This, in turn, would also fulfill his obligations to the Guard by transferring him to the Reserve wait list, so he was officially able to be "honorably discharged" of his obligations to the National Guard. Well, most would not have this special treatment, but afterall, Bush was due to attend Harvard Business School. Surely, that was merit enough to give Bush this easy out. The ARPC explained exactly what being assigned to ORS means. ORS means that you are placed higher up on the list of those to be called into active duty, but that does not mean that you will be called to duty. The other criteria for calling up an enlistee is also based upon the "AFSIC"- or as they clarified, your specialty training. 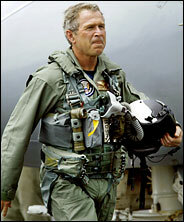 This was a near-guarantee that Bush would not be called to active duty, as the planes he was trained to fly had been phased out. After reviewing George W. Bush's military records, one has to wonder who truly flew the staged plane flight with Bush Jr ...which naturally leads us all to wonder WHO IS TRULY RUNNING THIS COUNTRY?? Skimming over your post this stuff sounds like the same old stories that have been floating aorund for years. some of this stuff was disproved some was not. All I can say as a US Army veteran of the first gulf war is that it does not matter to me one iota if George Bush jr. had served in Vietnam or not. Just as if Bill Clinton had actually served in vietnam would not make me approve of him or his policies. I do respect all vietnam veterans but I am not going to vote for John Kerry next time around based on him being a Navy Seal. of the points in the article have been "disproven"
Whaddya mean, no military experience? Actually, as usual, I get the last laugh here. by taking away their money and health insurance. I know it's in your nature to just be nasty Mothman, but it depneds on what you read and what you hear about George Bush's background. I am sure every scandalous verse on the internet about Geore Bush is true in your eyes. Being a communist I am sure you are used to having the wool pulled over your eyes. This much is a fact. He did fly jets in the National Guard. I dont know about you but I doubt there are too many stupid people who can fly fighter aircraft. You can have the last laugh all you want, I served my country and I am proud of it. For my service I got a free college education (well, not entirley free). I was never lied to about how much money I would get or what I would get in the way of benefits. I served with many good great people from many different countries. (Canadinas, Brits, French and many arabic military personell). I was proud to do it. If I ever get around to having kids I hope they will want to serve for a short time also. So honestly dude, you are going to tell me how bad it was/is to serve in the American armed forces when there are Russian soldiers, officers, pilots and even nuclear scientists that get paid meager salaries not monthly but whenever their govt can afford to pay them? that's silly. When I was in Saudia Arabia we lived in a building right next to the French Foreign Legion. They were nice enough fellas but let me tell you...their uniforms were ratty and their equipment was second rate. regarding the veracity of the information I post. program told me that it was "cool" to be Russian, or a Socialist. believe it. What a simple-minded approach. Wow, I kind of expected some kind of rational, well thought out response but of course what I got was more mindless drivel from you Indrid. "Oh I can't respond to your questions or posts because you are not worthy of my response" Pfftt...what a cheeseball. I have been all over the world Indrid (snicker snicker, nice name...oh dear are you the Mothman?) and the only thing I have not come across was a successful communist state. In fact there has never been one. So you can act aloof if you wish but you only look like an idiot spouting rhetoric from a proven many times over to be a failure- ideology. I know you probably think you are in some kind of cool socialist clich? or something but you are most probably a very lonely person with only this board to take revenge for you bitter and sad life. So go ahead and go back to Russia from wherever you are now, you will still find a second rate economy, a dilapidated infrastructure and a bunch of people who would sell their souls to live here. sad, lonely state of being. button gets pressed: Your opinion is worthless. realize it and too jaded to care. I too am a vet. I also agree that Bush's military record is not critical to his ability as CinC. Independent of that, I think he is trigger-happy. In addition, he is listening to people at the Defence dep't. on matters that should better be handled by the State dep't.. He is in a position of immense power. When he was campaigning, he said that the US should be humble in their position as a super-power. He needs to follow his own advice. yeah yeah, you told me before you were hitting the "ignore" button and yet here you are again responding to me. You try to silence someone by acting elite but you are so sad that anytime of day or night, if I come on this board and respond to you, you respond back within mere moments. It doesnt matter if I come back in three days or one...you are ALWAYS here. Proving you are doing nothing but sitting on your computer hitting the refresh button. All day long. All night long. Sad and lonely little man. Here is my message to you. Communsim is never going to make a come-back. Tell everyone at the hip little coffee shop that I said so. You can not prove anything you post and you will not repond with anything but elitist-melodramatic, this is MY board, I was here first!-drivel. You hold a point of view that is held by many of my friends . I respect that opinion although I disagree with it. I do not believe Bush is trigger-happy and whether you think it was the right thing to do or not, I believe that HE believed he was doing the right thing and protecting America by getting rid of Saddam Hussein. I agree with him. I take the side that would eradicate communism in any form. What you said does not prove that there were two, what we would call successful, communist states. There are still a few communist states that have either been allowed to flourish or have not collapsed from within. Why is South Korea such an advanced society and one of the worlds major economies when right across the border people are still washing their clothes in sewage filled streams while the population starves? Is it because the North Koreans are inherently a more stupid people? NO..it's because they are living under one of the most backwards societies with one of the most backward regimes still on the planet, relying on a form of government that suppresses individual creativity, rights and expression. You are from Austin I see. I just moved from there (to Seattle) in September. I liked Austin a lot. Little too hot for my nothern blood though. I used to work at Retro-Studios up off of Braker in northern Austin. ever heard of it? Quote:"as usual, I get the last laugh here." Oh now the marines and the navy show up to help me out! Where were you two when I was getting pummeled by Indrid and his limp wristed, lonely band of elitist sissies? Regimes like South Africa, Guatemala, El Salvador, Brazil, Egypt, and Pakistan are hardly what the US would call "allies". We may cooperate and may not be enemies but Egypt is hardly a democracy. There are NO Arab democracies. Anyway, I am sure you can go around the globe and point out here or there a country that is NOT successful but the fact is that the worlds richest economies are all democracies. There is not one, nor has there ever been a successful communist country on the level that most democratized countries gain. Hong Kong has nothing going for it except being free-market. No natural resources, nothing! But it is a vibrant economy while the country surrounding it is floating along the back-water of history. I work with a man from Romania and he knows first hand about life under communism. He is a great artist,one of the best at the company I work for. In Romania he was TOLD that because his father worked on farm equipment that HE was going to work on farm equipment. I am sorry Azoz, you seem like a nice person but you communism stifles the human soul. I'm sorry Gandalf, what "claim" are you talking about? I have never heard once Bush tout his military expertise as a reason to (or not to) vote for him. The one time I was swayed to vote for a veteran was for John McCain when he was running against Bush. I still like McCain but I am glad that he lost. Look dude, I am not going to read every single line that that idiot Indrid copies from one website and posts on the next. All I am saying is that you guys make it sound like George Bush is trying to pass himself off as some sort of war hero while shoving a chest full of medals in everyone's face. that just isn't so. Bush's military background has nothing to do with anything. Please don't deteriorate into the simple minded, elitist blathering idiot that is Indrid. "if you disagree with me I will put you on my ignore list! boo-hoo hoo!"